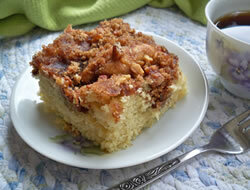 If you like crumb topping as much as cake, this recipe's for you. 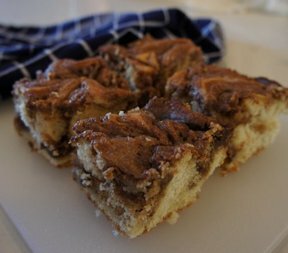 A thick layer of cinnamon-spiced crumb topping sits atop coffee cake that starts with a cake mix. 1. Preheat oven to 350° F. Mix flour, sugars and cinnamon in large bowl. Cut in cold butter with pastry blender or 2 knives until mixture resembles coarse crumbs. Set aside. 3. Spread evenly in greased and floured 13x9-inch baking pan. Sprinkle evenly with topping mixture. 4. Bake 30 to 35 minutes or until cake pulls away from sides of pan. Cool on wire rack. 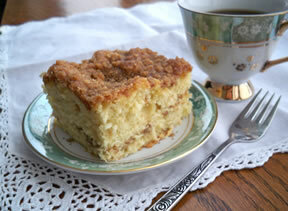 Cut into squares to serve.Blueberry Crumb Cake: Prepare topping and batter as directed. Spread batter in baking pan. Sprinkle with 1 cup blueberries, then the topping mixture. Bake 45 minutes.